Whether you’re holding a party to celebrate November 5th or simply need some inspiration for easy, wholesome and tasty dishes all the family can enjoy, look no further than these hearty meal ideas from Bannisters Yorkshire Family Farm. They’ve taken all that’s best about a British Autumn, not least the finest British potatoes, and baked and frozen them to capture that mouth-watering just baked taste. When you need them, simply microwave from frozen and in a matter of minutes you’ll have a piping hot, perfectly baked potato begging for a filling of your choice. Enjoy this classic flavour combination with the added earthy kick of a potato – the ultimate taste of autumn! Heat the oil in a frying pan, add the mushrooms and stir them until coated in oil and season with a good pinch of salt. Fry over a medium heat for 5 mins or until they give up their juices and are soft. Increase the heat, stirring until most of the juices have gone, then add the garlic and fry for 30 seconds or so. Remove from the heat, add the Worcestershire sauce, creme fraiche, cheese and freshly ground black pepper and mix well. Gently heat the mixture until a smooth creamy sauce forms. Divide the mixture between hot baked potatoes and scatter with snipped fresh chives. What do you think of this Blue Cheese And ‘shrooms recipe? Recipe and image c/o Bannisters Yorkshire Family Farm. For more information about the full range, visit the Bannisters Yorkshire Family Farm website or to pick up a pack of 4 Bannisters Yorkshire Family Farm Baked Potatoes or 6 Bannister Yorkshire Family Farm Little Jacket Potatoes for around £2.00 - £2.50 in the freezer aisles of Tesco, Waitrose, Morrisons, Aldi, Ocado, Iceland, Whole Foods, Costcutter and Nisa. Looking for so more recipe ideas? Check out my Recipe Collection Here. I love potatoes of any kind. These look so good. Thanks for sharing at the Snickerdoodle Create Bake Make Party. This looks simply amazing!! Pinned! Thanks for sharing at the What's for Dinner party - hope to see you next week too. In the mean time, have a fabulous week ahead! 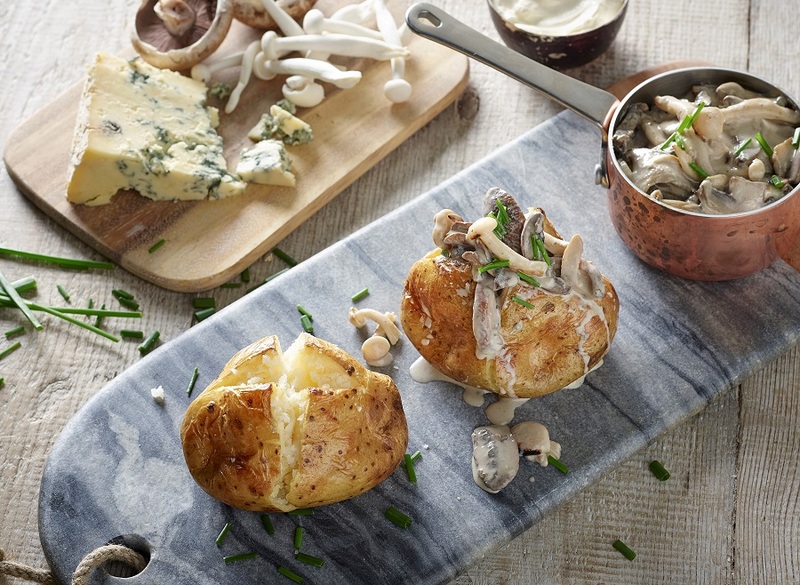 Your Blue Cheese and Shrooms look fabulous on top of that potato! Thanks so much for sharing with Full Plate Thursday and have a great week!